When my client first called me in 1998 I could almost feel his voice trembling with excitement. He and his wife had gone to an auction in northern Connecticut to bid on furniture, when what to his wondering eyes should appear but a double bass unlike anything he’d ever seen. They didn’t get the armoire but they did come home with a gem of Americana! 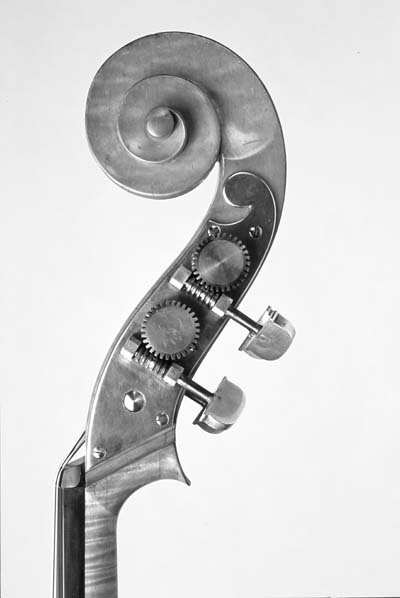 The bass was made in 1841 by Josiah Bennett Allen of Springfield, Massachusetts. A contemporary of Abraham Prescott, Allen was known as a maker of microscopes, telescopes, and musical instruments. Springfield at that time was an industrial city and site of a U.S. Arsenal. Allen was exposed to, and possibly contributed to, cutting edge technology. For example, the silver electro-plating on the brass tuning keys and plates was a process that was invented in the 1830s. The instrument’s label reads, “Manufactured by J.B. Allen,” marking a time when hand-work was homely and unsophisticated and “factory-made” had an aura of precision and quality. The instrument had been commissioned by the Congregational Church of Enfield, Connecticut, and was in service for only a brief term judging by the almost new condition of the edges and varnish, and the lack of any sinkage or distortion in the top. It was consigned to storage in a very dry place, perhaps a boiler room or an attic judging from the gaping cracks in the top and sides and by the smudges of soot. The bass is large and beautifully proportioned with a flat back, designed by a maker who clearly paid close attention to every aspect of its contour and construction. It is made of highly flamed sugar maple with a 15-piece quarter-sawn white pine top. 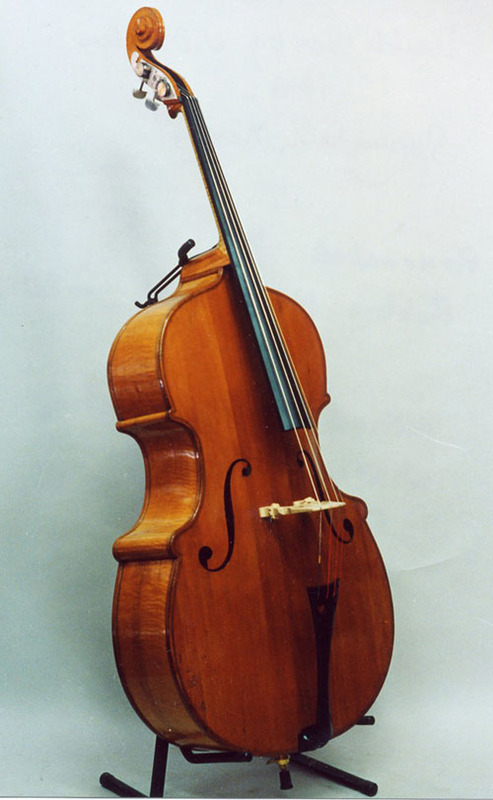 Moldings, similar to the external linings found on some of Prescott’s basses, are very fine and well proportioned. The double purfling and inlays are made of maple and rosewood. The voluptuous, elongated f-holes state the curvaceous theme. There are busetto corners on all four corners. The silvered plates of the tuning gears echo the feminine grace of the volute and pegbox. My client and I talked about the historical importance of this bass. Neither he nor I nor my mentor Lou DiLeone had ever seen such meticulous workmanship on an American-made instrument. We debated the ethics of altering this work of art, but we agreed that the most appropriate and responsible course was to get it into playing condition: (1) add the fourth string; (2) graft a new neck to give the bridge more height and to shorten the string length; (3) replace the bass bar. Adding the fourth string posed an interesting technical problem since the pegbox offered no room for a fourth gear. Josh Ward, an inventor and master machinist in Hudson Falls, N.Y. who specializes in gears, devised a solution where he piggybacked two small capstans on the shaft of the A-gear, and added the D-gear directly opposite. Rotating on a common floating shaft spanning the A- and D-gears, the strings can be tuned separately. Josh also fabricated a new E-gear to replace a crudely made substitute. Shortening the string length and changing the geometry of the neck of an old, large bass is always a balancing act that sometimes results in a compromise between ease of playing in the lower register and access to thumb position. The J.B. Allen is large but most of its size is in the lower bout (28 1/2 inches wide), and the measurement from the bridge to the neck was a standard 3/4 size dimension (22 1/2 inches), making the shorter string length appropriate to the shoulder height. The increased set-out (1 1/4 inches) helped to ease the transition to thumb position. A new neck block was fitted, as there was none to begin with, only the “foot” which was an extension of the neck wood. It was necessary to remove the bass bar in order to reinforce the crack repairs in the top. The cracks here and in the ribs were wide and daunting, but there was no wood missing so in most cases they closed up neatly. The rib cracks were caused by the wood shrinking while being held to the blocks. By loosening the ribs from the blocks I was able to close these cracks but I had to add a wedge of rib wood to maintain the rib height. I then loosened the moldings and moved them up to the top of the rib, hiding the wedges. The white pine top is graduated such that a ledge around the edge stands 1/16 inches proud of the carved underside, giving clearance between the seam and the arching. 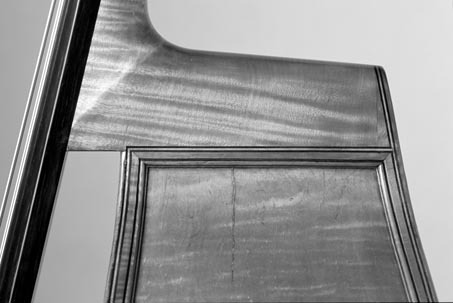 It’s possible that J.B. Allen intended this ledge to protect the arching when the top was being removed for repairs, a detail that present-day luthiers might imitate. But he apparently never meant the top to be removed because there is no overhang – the edges are flush with the side moldings and he concealed the seam with a purfling-like inlay. A 19th century repairman, apparently confounded by this impregnable box, had a clever alternative to violating the inlay. He needed to repair cracks in both bottom ribs. “Why remove the entire top when you can just remove the wings?” thought he. So he sawed off the wings, made his repair, and replaced the wings, minus the kerf! I took many deep breaths before I embarked on removing the top. The first task was to eliminate the inlay around the seam. With the seam exposed, removal was straightforward. A new bottom block was needed in order to shorten the ribs so that the plates would reach to the perimeter of the body. With all the repairs and modifications made, it was my turn to seal it up “forever” in the manner of J.B. Allen by inlaying the 3-piece purfling around the seams. The varnish is shellac, pure and simple. It is very thin, smooth, and clear. I tried to dissolve a sample from a piece of the neck but alcohol wouldn’t touch it. X-ray spectrography identified the substance as shellac. The varnish needed only a washing and a minimal amount of French polishing to restore its luster. In the five years since its restoration, the J.B. Allen has matured. Its sound spectrum is complex with a broad, deep tone and although it’s not a loud bass, it has a clear attack and a direct, versatile tone quality that responds to the demands of varied repertoire. Robert G. McIntosh lives in Cambridge, NY with his wife, Bliss. After a 20-year career as a cabinetmaker, he restored a bass for his older daughter to play, at which time he met Louis DiLeone of Orange, CT. He has spent the last ten years restoring basses and has recently begun making basses.